Hand-crafted 3x3 A-Frame tractor style duratemp chicken coop measures 3' by 3', stands 58" high and sits 14" off the ground. There are also three 1 foot wide by 1 foot deep nesting boxes, along with 2 wheels with wheelbarrow handles and a 3' x 3' run area. The capacity of this coop is 3 - 5 chickens. 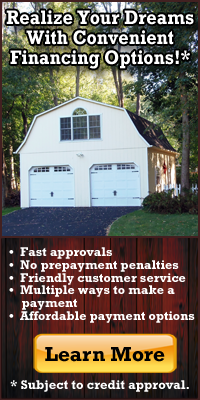 Each chicken coop is hand-crafted in the United States by expert Amish woodworkers and finished to order with your choice of siding color, trim color, door color and roof shingle color. You can also select an optional metal roof. Hand-crafted 3x3 A-Frame board and batten chicken coop measures 3' by 3', stands 58" high and sits 14" off the ground. There are also three 1 foot wide by 1 foot deep nesting boxes, along with 2 wheels with wheelbarrow handles and a 3' x 3' run area. The capacity of this coop is 3 - 5 chickens. Each chicken coop is hand-crafted in the United States by expert Amish woodworkers and finished to order with your choice of stain color and roof shingle color. You can also select an optional metal roof. Shown with optional green metal roof and heavy-duty wheel system. 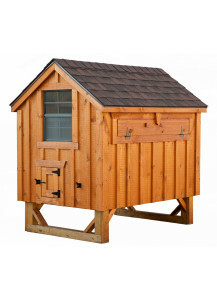 Hand-crafted 4x6 A-Frame duratemp chicken coop measures 4' by 6', stands 79" high and sits 14" off the ground. There are also six 1 foot wide by 1 foot deep nesting boxes. The capacity of this coop is 12 - 15 chickens. 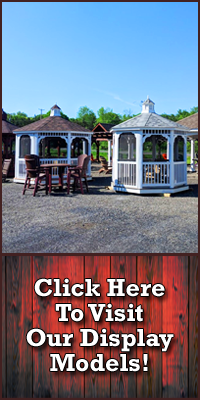 Each chicken coop is hand-crafted in the United States by expert Amish woodworkers and finished to order with your choice of siding color, trim color, door color and roof shingle color. You can also select an optional metal roof. Hand-crafted 4x6 A-Frame board and batten chicken coop measures 4' by 6', stands 79" high and sits 14" off the ground. There are also six 1 foot wide by 1 foot deep nesting boxes. The capacity of this coop is 12 - 15 chickens. 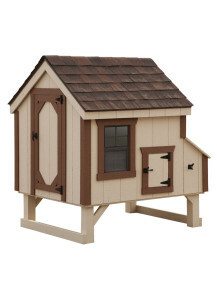 Each chicken coop is hand-crafted in the United States by expert Amish woodworkers and finished to order with your choice of stain color and roof shingle color. You can also select an optional metal roof. Shown with optional green metal roof and heavy-duty wheel system. Hand-crafted 6x10 A-Frame duratemp chicken coop measures 6' by 10', stands 101" high and sits 4" off the ground with a 6' x 6' chicken area and a 4' x 6' feed room. There are also six 1 foot wide by 1 foot deep nesting boxes. The capacity of this coop is 18 - 22 chickens. 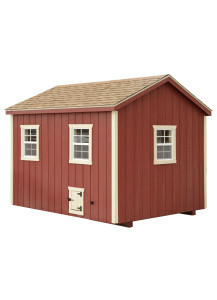 Each chicken coop is hand-crafted in the United States by expert Amish woodworkers and finished to order with your choice of siding color, trim color, door color and roof shingle color. You can also select an optional metal roof. Hand-crafted 8x10 A-Frame duratemp chicken coop measures 8' by 10', stands 101" high and sits 4" off the ground with a 6' x 8' chicken area and a 4' x 8' feed room. There are also eight 1 foot wide by 1 foot deep nesting boxes. The capacity of this coop is 24 - 28 chickens. 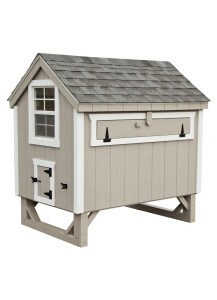 Each chicken coop is hand-crafted in the United States by expert Amish woodworkers and finished to order with your choice of siding color, trim color, door color and roof shingle color. You can also select an optional metal roof.